I’m knitting myself a cowl. It’s a simple Chevron Lace that I’ve knit a few times before, but this time it’s for me. The yarn is from my talented friend. The skein was a OOAK skein that she gave me as a Christmas present. And of course, I had to cast on immediately! I love the way the yarn is knitting up. The lace eyelets form chevrons across the width of the shawl and look best when you work the decreases to lean the correct way. For this pattern, the left leaning decrease is the ssk and the right leaning decrease is the k2tog. These are fairly common decreases and chances are good you know how to knit them. The skpo is another left leaning decrease that looks almost identical to the ssk, but I prefer working the ssk. A k2tog is a right leaning decrease. When a k2tog is worked, two stitches are worked as though they are one stitch. The two stitches circled in blue on the left are going to be knit together as though they are one stitch. The center pic shows the right needle being inserted knitwise through both stitches and the right pic shows the completed decrease. Circled in blue on the right are the same two stitches from the right. You can see how only one pink stitch has combined the two grey stitches and that the decrease leans to the right. An ssk is left leaning decrease. When an ssk is worked, two stitches are worked together as though they are one, but in a different way than for a k2tog. First the stitches are slipped knitwise. 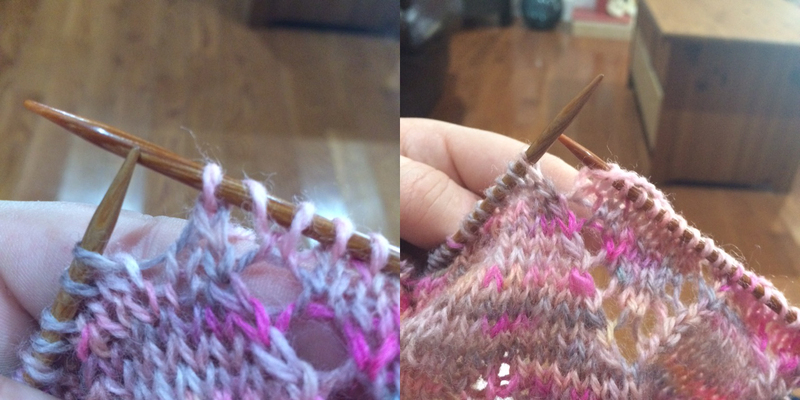 The left pic shows a st being slipped knitwise. The center pic shows both stitches slipped to the rh* needle. The right pic shows the lh* needle inserted in front of the rh needle ready for the two stitches to be worked as one. The two stitches are being knit through the back of the loops to form the finished SSK. The pic on the left show the completed ssk. You can see the two stitches from the left pic above now overlapping each other and forming one stitch and that the decrease leans to the left. 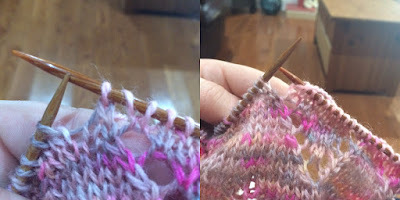 The pic on the right shows a skpo formed by slipping one st knitwise, knitting one st, and passing the slipped stitch over the knit stitch in a manner similar to casting off. You can see that this decrease also leans to the left. I prefer the execution of the ssk, although both give similar results. I love how the orientation of the decreases emphasizes the chevron eyelets!